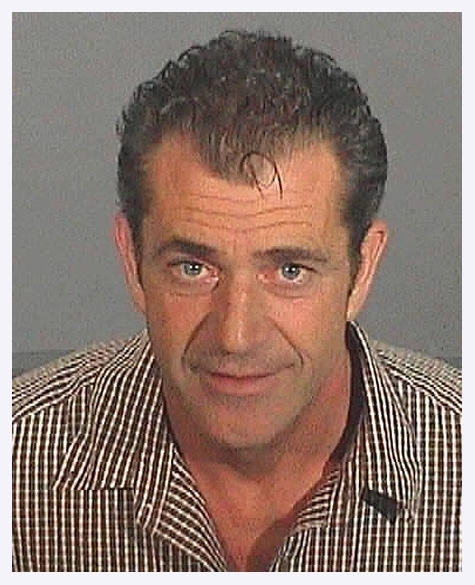 This mug shot of Mel Gibson was taken following the Hollywood star's slur-spewing drunk driving bust in July 2006. Considering some of the booking photos previously snapped by Los Angeles sheriff's deputies, the 50-year-old actor looks downright dapper. Submitted by Watsons Pills on Mon, 2011-04-04 23:41. Hey, Mel! It's 10 o'clock. Do you know what time it is? Submitted by Darveesh on Tue, 2011-03-01 13:51. Submitted by GeorgeDubyaBush on Wed, 2010-09-29 20:51. Submitted by Starrman69 on Sat, 2010-09-25 19:26. Mel, what the Hell! Get yourself a driver! Submitted by WOODS19D on Mon, 2010-08-30 13:40.